The Sahara Hotel in Las Vegas closed down today and marks the end of era. 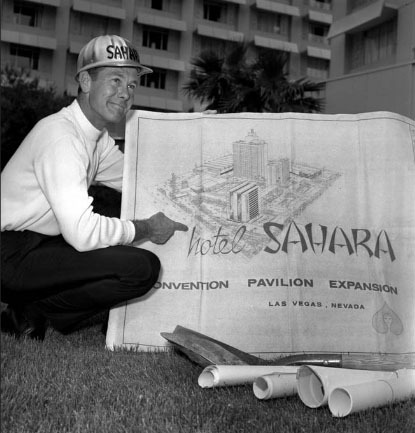 The Sahara Hotel was designed by the Norwegian-born Ragnar Qvale in 1952. 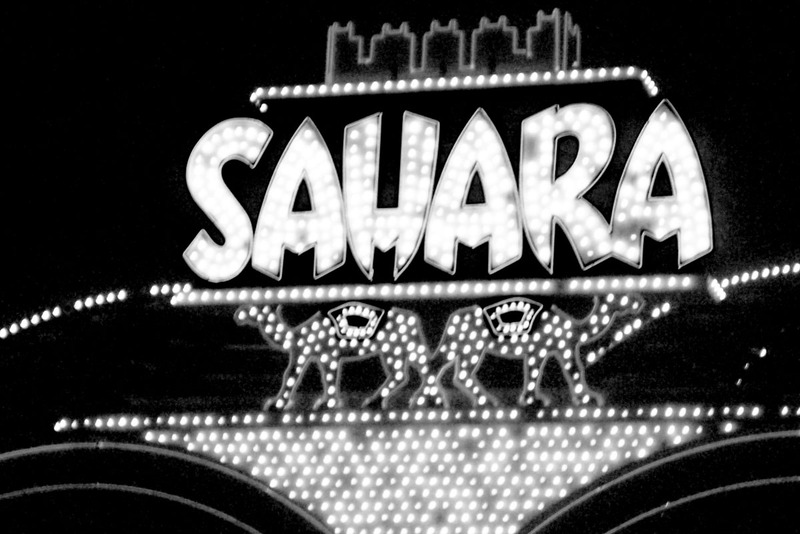 The Sahara hosted everyone from Jerry Lewis to Frank Sinatra. Yes, even Elvis Presley and the Beatles. Thank you for the memories Sahara! The attractive structure, outstanding for its modern simplicity and design, and sprawling over 20 acres of beautifully landscaped grounds, represents an innovation in comfortable living. Outstanding exterior features are the broad expanses of white roof, a tremendous entrance pylon and strikingly beautiful marquee. 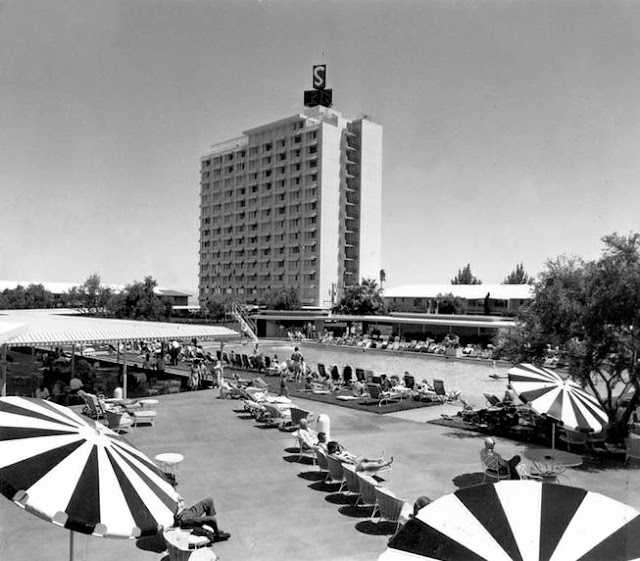 Hotel Sahara was constructed by Del E. Webb Construction Co. of Los Angeles and Phoenix with Max Maltzman acting as supervising architect. Structural interior of the administration building were designed by Ragnar Qvale, Los Angeles and his staff of designers and artists. The Qvale organization is also responsible for the decorative murals and the designing of all items such as opening announcements, menu covers, and the uniforms for the people who serve the patrons. A harmony of color and design has been attained, simple, gay, playful - delightfully amusing, and all in keeping with the Sahara theme. The hotel was furnished throughout by Albert Parvin Company of Los Angeles. The Sahara consists of 240 rooms, each planned as a home within a hotel; the rooms boast of 48 specially custom-built studios - four types which include 38 full-size bedrooms, three king-size twin bedrooms, 11 types of 143 twin bedrooms, two deluxe suites and two "dignitary" super-deluxe suites. Every room has been specially designed to offer the most in style, combining the best in design and decor, but ever mindful of the ultimate comfort of the guest. All lamps are designed exclusively for Hotel Sahara; all rooms have lined and interlined draperies to exclude any penetration of light during night or day. There are primarily four styles with 20 to 30 variations in wall colors, drapery colors and wall-paper arrangements. One group of furnishings, very appropriately named "Balihi," is a contemporary style in a light and airy finish which adds color and charm to all rooms be it a studio, twin, or full size arrangement. Another room style is of contemporary decor in a wheat-finish group of furnishings with all accessories specially designed and arranged to compliment the various pieces of wheat-finished furniture. Type three consists of a group of rooms with the primary furnishings in a desert grey finish, with all accessories, upholstery and decor tying in with the magnificent specially-created desert grey furnishings contained in these rooms. Type four is a new contemporary type Ranch Oak group of furnishings with the particular feeling of the new West, finished in a tawny oak color and all accessories and decor an intricate part of the furnishings. The rooms have basically four different colors of high-textured, round-wire carpeting and have used the emerald greens, the dawn greys, the desert tans and bittersweet cocoa to augment the furnishings. In special design, thought was given to minute details, even special shower curtain and chenille bath rugs. In all cases, consideration was particularly given as to linens and towels and throughout the entire hotel, nothing but fine Cannon percales are being used for sheets and cases, and the finest of Cannon towels and bath mats have the Sahara crest. In the suits, particularly the two dignitary suites, Albert Parvin Company's top decorators, Bill Yates and Harry McCague were given the assignments and to forget about all costs and think of nothing but comfort and decor. One suite is in traditional manner, using the modern approach, with French Provincial a the theme. In the bedroom of the suite, they used a king-size 6 x 7 bed and specially hand-tailored spreads and drapes. In the living room, which is primarily a living room, it is furnished to suit the taste of royalty. In the other dignitary suite, here the contemporary manner was vitally expressed by Yates and McCague and throughout the suite a heavy, creamy-white piled carpet was used, and they again repeated the 6'7 king-sized bed in the bedroom as well as special hand-tailored drapes and bedspread. In the living room, every piece of furniture, lamps and accessories were custom-made and specially designed with the thought in mind of making it "fit for a Queen." In addition to the two dignitary suites, there are two more living room-bedroom suites styled in a contemporary manner; no detail was overlooked for the guests' comfort. There are a number of other suites that combine the studio room with the bedroom, making it possible to have as many as four guests in one party accommodated in one suite. The studio living room can be converted into a bedroom. Truly Las Vegas' most sensational public rooms are Hotel Sahara's two lobbies. One is the reception desk lobby and the other the North entrance lobby, which is primarily for the convenience of the guest to enter from the parking lot. The spacious and beautifully deigned cocktail lounge and bar, The Casbar; the elaborate casino; "The Congo Room" which is the main dining and supper club, and the Caravan room or coffee shop, all follow the decor and furnishings of the designer. No time, expense or research was spared by Albert Parvin Company in making these rooms refreshing, beautiful and comfortable. The "Congo Room" is truly taken from the depths of the Sahara, embellished with the feeling of jungle with the ultimate in elegance and comfort. The carpet in this room was exclusively designed and woven for Hotel Sahara. The design is arrows and shields on a blue background with coral, belges and lighter shades of blue woven through the patterns. All of the booths and banquettes are upholstered in a white Palmetto leather-like plastic. All of the dining chairs are upholstered in gold textured fabric and the wood finish is a deep Cordovan. The wall colors are of coral finish, with special hand-painted murals applied, carrying the theme of the Congo. Myriad tropical planting has been carefully installed throughout the entire room and surround the six-foot life-size beautifully plumed Watusi figures. The Caravan Room, or coffee shop, again expresses careful thought as to design and furnishings. Again specially designed and woven carpet was developed for this room as well as beautifully styled, upholstered chairs, in a natural wheat finish with a lime, textured fabric upholstery reflecting a cool and refreshing feeling where the oasis is an intricate part of the desert. Hand painted murals reflect and indicate why this room is being called "The Caravan." The cocktail lounge has a unique 85-foot bar with dual purpose. This bar is one of the most unique bars of its kind and is a combination stand-up and sit-down. Near the stage platform in the center of the bar, guests can sit down as they would at a table in the cocktail lounge "date-room" and be entertained with top-flight, nationally known musical groups. On each side of the sit-down section, the arrangement is the regular stand-up size bar so one can view the cocktail lounge as well as the casino.